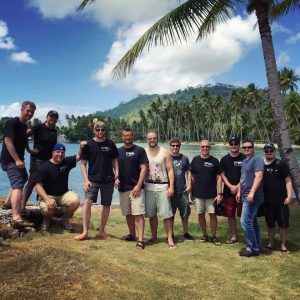 The guys at Dan’s Dive Shop of St Catharines in Ontario, Canada were so keen to get to Truk Lagoon in Micronesia, they booked the trip three years in advance. Far out in the Pacific Ocean, Truk is a very long way from Ontario but this was a trip of a lifetime. Today Truk Lagoon (officially Chuuk Lagoon) is a quiet island paradise but during WWII this pristine tropical lagoon ringed by 225km (140 miles) of protective reef was the forward anchorage of the Japanese Imperial Fleet in the Pacific. 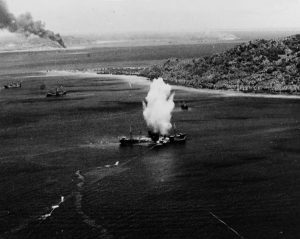 Heavily fortified and defended, Truk eventually came under sustained attack from US forces in 1944 with the launch of Operation Hailstone. The attack lasted for three days, as American carrier-based planes sank twelve smaller Japanese warships (light cruisers, destroyers, and auxiliaries) and thirty-two merchant ships, while destroying 275 aircraft, mainly on the ground. A Mark XIII aerial torpedo hits a Japanese cargo ship, during the first day of U.S. Navy carrier air raids on Truk, 17 February 1944. Photo: U.S Navy War Correspondent Smith. 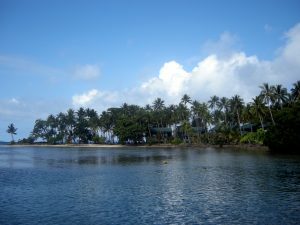 In 1969, famous French oceanographer Jacques Cousteau and his team explored Truk Lagoon. Following Cousteau’s 1971 television documentary about the lagoon and its ghostly remains, the place became a scuba diving mecca, drawing wreck diving enthusiasts from around the world to see its many, virtually intact sunken ships. 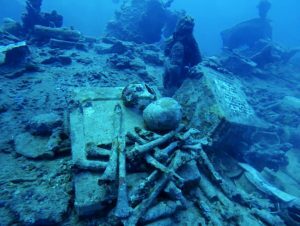 The shipwrecks and remains are sometimes referred to as the “Ghost Fleet of Truk Lagoon”. 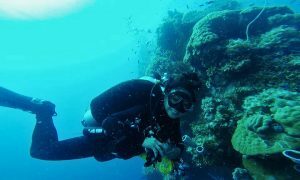 Here, Justin Steele of the Dan’s Dive Shop group takes up their story. We departed Toronto in the wee hours of the morning on Air Canada, which took us to LAX. 13,220km and 32 hours (22 in the air), we had arrived. 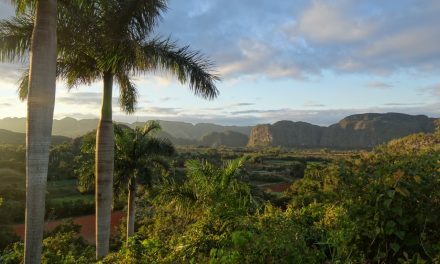 Chuck state was so beautiful, very reminiscent of when I was a child and my parents would take me on vacation to Caribbean islands that now are modernised and built up, but back then were very authentic and full of local culture unspoiled by foreigners. 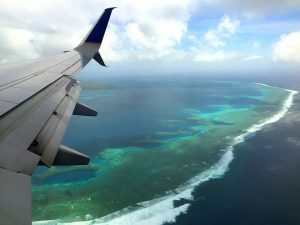 The airport was located on the island of Weno and featured one runway that could accommodate just a single plane at a time. The airport building was little more than a large, single-story waiting room that featured one giant fan at the snack bar and a lot of broken a/c units, forcing most of the patrons to fan themselves in the heat. It did, however, have a beautiful ocean backdrop. Jumping aboard a bus playing some local authentic Chuukese folk music that was reminiscent of Bob Dylan or Yoko Ono, we set off at a snail’s pace on an uneven road with potholes the size of small craters. Out the windows the countryside was absolutely beautiful with large mountains and palm trees as far as the eye could see. There were bunches of bananas in the trees, local children playing ball or chopping coconuts with machetes, and girls dressed up in their best school clothing, giggling and waving as we passed by. We also noticed many buildings that were old wartime barracks converted to churches, school houses, homes and more. We were told that many of the roads and buildings still in use were built by the Japanese over 70 years ago. After a short distance but a very long drive, we arrived at the Blue Lagoon Resort. 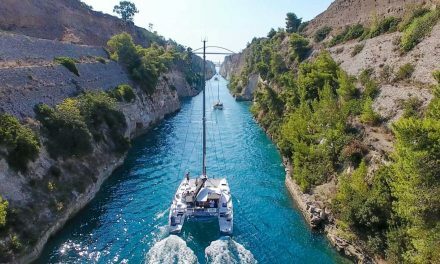 When we booked this trip three years ago, the intention was to dive in style and enjoy a 5-star dive experience aboard a boat that hadn’t yet been built. Last March, however, that boat, newly minted and not even a year old, was caught in a hurricane. Winds of 100 miles an hour or more blew the vessel around like paper, sending it on a trip around the lagoon before its final fate of being beached on the reef, where it was later stripped by the crew of its valuables and burned to the waterline. When such a tragedy befell our plans, many of our guests were crushed and since time was of the essence, we had to quickly look for alternatives to keep the forward momentum of the trip going. We turned to “Plan B” which was a combination land and sea package with 4 days on land at the Blue Lagoon Resort and Dive Shop and the second half of the trip aboard the Steamship Thorfinn. We hadn’t the faintest idea what to expect from the Blue Lagoon with reviews being so mixed about the resort, but it was a blessing and gave us time to reset our internal clocks, slowly get used to the time change and soak up the sun and scenery as much as we wanted, with dives in the morning and afternoon if we wanted them. Flying to Chuuk put us ahead in the future 15 hours so we took the time to adjust to the changes, enjoy some well needed sleep, some awesome local cuisine and our first series of two tank dives, which turned into a late morning/early afternoon start by the time all of our gear was set up. The resort staff were kind, the food was great at the restaurant, the dive staff spoke English very well and the dive boats were efficient, although nothing special. 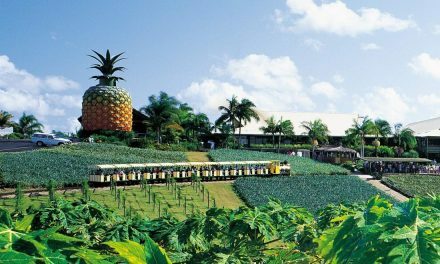 We are already planning our trip back here because it was such a great experience and great value. If you want glamour and glitz, you’re in the wrong sport, our rating of 5 stars is for divers. Bear in mind we are visiting and diving in a Third World country, if you want to be pampered find a different hobby or rent a luxury yacht for a week and try it yourself. The SS Thorfinn is a 50m (170ft) live aboard dive vessel that was formerly a Norwegain whaler. As the week progressed we began to look ahead to the second leg of the trip aboard the SS Thorfinn. At first glance online the Thorfinn looked older, had a few less amenities than our fantasy boat that was now becoming an artificial reef with each passing day, and the reviews were not all that promising. Nor was the massive black cloud of coal smoke that was spouting out sulphur dioxide, nitrogen oxide, soot and ash as it slowly chugged towards us for pickup at the resort. For a brief moment we stared, eyes wide, mouths open, asking ourselves if we could just spend the rest of the week at the resort where we had land and clean air. But then we met the friendly, helpful staff who came to collect us with two of the nicest laid out rigid hull, aluminium-chambered dive boats we’d ever seen, so we took the leap of faith off the dock and proceeded forward on to the next chapter of our journey. The SS Thorfinn was massive, which makes sense as they’re known as the largest live aboard dive vessel in the world at 50m (170ft). The Thorfinn was a Norwegian whaling ship in its former life. Our briefing and orientation was conducted by the captain himself, Lance Higgs, who at first glance instantly reminded me of Lloyd Bridges. He had a deep voice, reminiscent of a radio announcer, which easily kept the audience of excited scuba divers engaged for the duration of his speech. 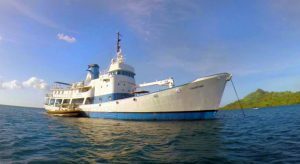 At 78 years of age, Captain Lance has over 50 years of experience sailing around the world and has run diving excursions throughout the Chuuk region for many decades. Despite the mixed reviews, we found the Thorfinn’s rooms to be clean and comfortable, the food was good and plentiful and the staff were terrific. The SS Thorfinn is essentially a floating hotel and from this platform divers depart aboard the RIBs (rigid hull inflatable boats) that take the groups to different dive sites. The dive boats try to vary where groups go daily, encouraging divers to mix it up and get a sampling of as many different sites as they can hit. Each boat goes to a different location unless otherwise agreed upon to facilitate the needs of advanced/technical divers, as well as less experienced/recreational divers, which is what we had, a mixed group of both rec and tech divers. The boats were perfectly laid out for both recreational and technical divers. Divers had a bench seat that opened up and had more than enough room for all but the largest camera systems to keep the deck free and clear. The ladder could’ve been 1-2 rungs longer and on more of an angle, but the surface staff handled the logistics of getting the divers back on the boat very efficiently in rougher surface conditions. We had two dive guides, Katsashi and Erik, who were both very quality oriented and very kind, caring individuals, especially Erik, who was the recreational boat’s guide. Simply put, it was awesome! Anytime you put giant steel battleships in the water to dive around and through and there are guns, tanks, airplanes, trucks, cars, torpedoes, ammunition, mines, portholes, artifacts, gasmasks, human remains, great visibility, sharks, beautiful sea creatures, some varied coral formations and nice clean interiors free of coral to see the ship as it once was, you’re going to have a phenomenal experience. Most of the sites were within recreational limits with some wrecks being in 20m (65ft), most being in the 30m (100ft) range, while a few more were in the 30-45m (100-150ft) range, a couple at 50-55m (160-180ft) and the deepest dive, the San Francisco Maru, at 64m(210ft). Many of the ships were upright, with a couple of them lying on their sides. 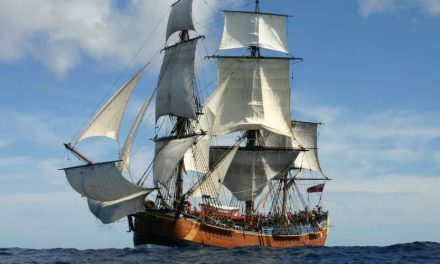 A stunning ship lying on its port side. The Yamagiri was hit by bombs or a torpedo on the starboard side. It features some fabulous swim-throughs with access to the entire ship. As you swim through this wreck you notice cases upon cases of Saki and empty bottles throughout. Maximum depth was 30m (100ft) and we saw a cool black and white Lionfish on this dive. The most notable feature of this wreck is in the engine room there is a skull wedged into the ceiling from a soldier being blown to pieces and the rest of his bones below and strewn around. There was possibly a second skull where it looked like only the back of the cranium was embedded into the wall and a large number of bones atop the machinery down a catwalk. This was a phenomenal dive! One of our personal favourites because we had the ability to dive a beautiful upright ship that had guns on the bow, truck frames inside the bow hold, direct access to the engine room via the hatches atop the ship, and by going down onto the seafloor you can swim in through the torpedo hole. As you make your way through the twisted metal, you see the damage explosives can do until the metal reforms back into a recognisable ship again after entering about 6m (20ft) in and up and through the hull. As you make your way towards the bridge the ship boasts a beautiful telegraph and a pair of Howitzer guns aft of the bridge. The Nippo featured some beautiful hallways to explore with access forward or aft. This was one we dove a few times. Our favourite of the dives, not because it was the deepest but because it was the best. This wreck starts at 42m (140ft) to the bridge and 48m (160ft) to the deck, and had a little bit of everything. 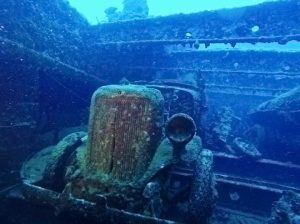 There were torpedoes and shells in the holds, two tanks on the starboard side bow, one on the port side, trucks and truck bodies in the bow hold, a large bow gun, a pretty windlass on the bow, sharks, skulls, turtles and fish. We did three dives here, including two on the same day. Maximum depth was 64m (210ft) and most of us dove this wreck as a technical dive on CCR or Open Circuit Trimix. The Shinkoku gives the diver the bonus of diving a beautiful coral-encrusted ship from the midship point to the stern in a reasonable depth range of 9-38m (30-125ft). 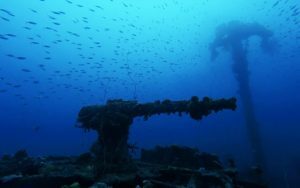 The wreck sits upright, features great fish life and is a fun wreck with lots to see. A more technical dive in terms of depth with the average depth ranging from 42-54m (140-180ft). The ship was a lovely upright wreck featuring a gorgeous windlass and crane trucks in the cargo holds. An anti-aircraft gun was one of the highlights on the mid stern of the ship, with a stern gun as well. A ship we were the least enthused to dive, yet it was one of the most impressive wrecks and one of the most fun. The ship was involved in a freak explosion when the side gun on the stern shot down a US plane that crashed into the first cargo hold where the ammunition was stored. The subsequent explosion was said to be a massive mushroom cloud reminiscent of an atomic bomb, which took the front half of the ship off. The Aikoku was double the size of the San Francisco Maru, making it the largest ship in the Lagoon. A commemorative plaque is placed before the destruction of the forward section and there are lots of human remains around. What made this wreck so interesting were the layers of what looked like melted, shifted and randomly laid out sheets of metal on the bow area. As the ship ceased looking like a ship suddenly, it became a scrap metal pile that dipped down deeper and deeper, sagging down towards the seafloor at 62m (205ft). We’re looking forward to exploring this wreck again on a return trip. The I-169 was not a remarkable wreck as far as penetration, but it was fun because it offered great wildlife with lots of manta rays and other critters. 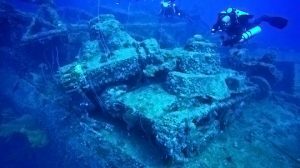 It also posed a fun challenge when we were told the Japanese soldiers who served on this wreck were only 4 feet 6 inches tall typically, so we wouldn’t be able to get inside. A couple of our divers accepted that challenge and were able to enter at midship and make their way forward, but the wreck was too unstable to go far. The I-169 Shinohara was lost when diving to avoid the bombing and had participated in the attack on Pearl Harbor in December 1941. This trip was one that had so many positives and it was thanks in part to the dive sites, the dive operators, the travel providers, but at the end of the day it was the guests who participated in the trip that made it all worth the distance. We had such a magical group of people who shared in the experience and we’ve all become closer as a result of it. We travelled together, watched each others’ backs, made sure that everyone was always accounted for, all the while trusting each other above and below the surface. Truk was a trip that I think has stayed in all the guests minds and memories of late, with texts received, messages shared and people reliving the moments that mattered on a regular basis. We are very lucky as a shop to have such great divers, customers and friends we can share these adventures with and for that I am truly grateful. This is an abridged version of Justin’s story republished with permission. The complete version contains a lot more information about dive equipment, associated costs divers can expect while on location and more about the diving itself, including additional wrecks. Jump over to the Green Ranger blog on the Dan’s Dive Shop site to read it and to watch more great videos like the one below.